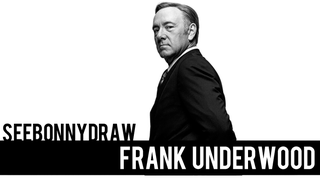 SeeBonnyDraw: Frank Underwood! In Speed Painting Form! House of Cards season 3 was recently released by Netflix over the weekend and our fix for everyone's favorite politician can now be met! Please be wary of discussing spoilers for your fellow TAYtertots, by the way! I myself am quite early into the latest season as well. I actually started this piece a while back in anticipation for the new series. I tend to do that often with the speed paintings - working on several at a time for the sake splitting up the work load and helps me keep fresh eyes before I spend too much time on one piece. Watching the video, it made me laugh how I approached Frank's head in blue...The floating face reminded me of Zordon from the Power Rangers haha. It also showed me how off my initial draft was (usually are) - I haven't gotten to the point where I can get exact line work down from the get go and I doubt I'll ever get there - nor is there really a need to be perfect like that. Is it even attainable?! Coloring the piece quickly helped me assign the features of the face. Portraits are my specialty and characters who are a bit older in age are way more entertaining to paint - they have so much more detail to recreate and therefore add to the challenge and make things more fun. A clean smooth face is boring, yo. After a while, I began adding my flurry of captivating colors but noticed something felt off - first of all, the reference shot was extremely tonal and cast in warm light, so my colors were imagined to be in place, but secondly, it didn't fit the character of the world. 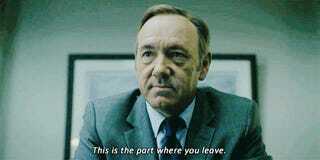 House of Cards is an extremely defined show in its visual design and consistent throughout the series. Colors are quite de-saturated and the whole world seems to be drenched in cool tones - as if masked by a navy blue filter. I brought that over to the piece using a limited palette for flesh tones and good old red white and blue for the political aspect. The red I used to define his rage - using it to fill in near his eyes and brow which convey his deep rooted anger. Blues help weigh down the planes with shadow. Lighting is limited but translated by the white of the canvas. All in all, this was an awesomely fun piece to work on. I'm extremely happy with the end result and I hope you are too. I know I missed posting this yesterday but I was actually busy over the weekend for once and got held back. Also, I know I missed last week with a post and that might be the case for the week next and throughout March possibly, so please excuse those absences. Okay, that's all for today gang! Thank you for taking a look at Frank and be sure to check out the video for the process if you were so inclined. One a Day kicks off for the week later tonight, so stay tuned.